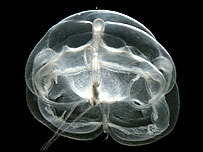 An international scientific team is to record and list the species thought to live deep in the Arctic Ocean's chill. One very deep area they will search, undisturbed for millennia, is said to contain the Earth's oldest seawater. The team, based at the University of Alaska, US, believes it is likely to find species never recorded before, and some commoner lifeforms in abundance. It says its task is now urgent because the onset of climate change requires very good baseline data on marine life. The team, setting out in August, will use submersibles, sonar detection and traditional techniques to record and make an inventory of the Arctic Ocean's lifeforms. It is part of the 10-year Census of Marine Life, a $1bn project involving marine scientists from across the globe. The team includes scientists from the circumpolar nations and others, but is being coordinated from the Alaska HQ. Three researchers there are Drs Rolf Gradinger, Russ Hopcroft and Bodil Bluhm. They said: "The tremendous ongoing changes make the effort to identify the diversity of life in the three major realms - sea ice, water column and sea floor - an urgent issue. "Species-level information is essential to discussions of climate change, its expressions and effects." The researchers will be studying life at different levels in the water column - a low-density surface layer, an intermediate layer which receives warm, salty water from the Atlantic, and a deep, dense layer. One area they will focus on is the Canada Basin, a huge and largely unknown submarine hole 3,800m (12,500ft) deep. Covered by ice, it lies immediately north of the Yukon Territory and Alaska, and is linked to the Pacific through the Bering Strait, a mere 70m (230ft) deep. The basin is shielded from the influence of the North Atlantic by the narrow Fram Strait between Greenland and Svalbard, and by the Lomonosov Ridge, which rises close to the surface. The ridge is to be the site later this year of an attempt to extract cores from sediments deep below the sea bed by the Arctic Coring Expedition (Acex). Many species in the extremely cold depths of the Canada Basin never travel to shallower waters and are thought to have been isolated there for millions of years. Among the novel animals the researchers expect to discover are cephalopods (like octopus, squid and cuttlefish) and jellyfish. Another focus will be the diversity of life around the mouths of Canadian and Russian rivers. Russian cooperation is seen as central to the project's success: institutions involved include the Russian Academy of Sciences and Moscow State University's zoological museum. 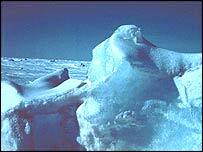 Dr Hopcroft said the Arctic was "certainly not the desert people thought it to be. Based on submersible experience in other oceans, we expect to discover at least twice as many species in most groups as currently described." But the project will not find it all plain sailing. One problem is the availability of very expensive icebreakers, which tend to be booked up years ahead. Political boundaries may also prove an obstacle, especially in seabed areas rich in raw materials or used for dumping nuclear and other waste. The chief scientist of the Census of Marine Life, Dr Ron O'Dor, told BBC News Online: "The Arctic was where both sides' submarines played hide-and-seek during the cold war. "It was essentially a war zone, not an easy place for biologists. Physical scientists have done a lot of work there, and what we're trying to do is to give the biologists a chance in the Arctic." Iceberg images courtesy of the US National Oceanic and Atmospheric Administration.